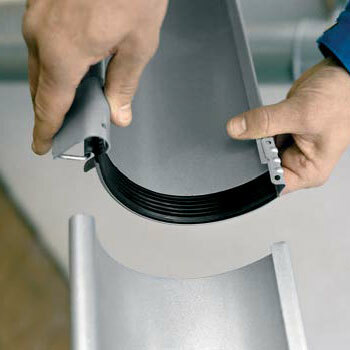 Lindab Rainline is the worlds best half round gutter system backed by 60 years experience and a tremendous warranty. Steel is the ultimate material for roof-drainage systems. It is easier to handle than aluminum and offers minimal thermal movement (thermal movement can cause cracking and result in system leakage). Lindab’s Rainline also has the lowest environmental impact of any gutter system. The strength of 23 gauge steel coupled with the rigidity of a half round design and the unique Lindab front bead creates a rainwater system that is stronger than other system on the market. Add to this the G-90 galvanization, the passivation layer, primer and high build polyester paint on both sides of the steel and Lindab Rainline™ Steel gutters will last a lifetime. No special tools are required. Gutters and downspouts connect without having to caulk, rivet or screw the pieces together all of which takes away the leaking corners or connectors and the collection of debris you so often see in the k-style systems. The Lindab Rainline half round system works year after year whilst looking aesthetically appealing which helps adding value to you home. The only maintenance required is an occasional wipe or wash down. Easy assembly and installation guarantee a long service life. 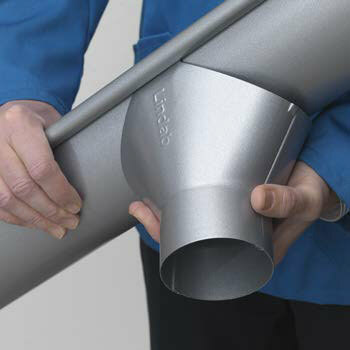 Lindab Rainline coated products all come with a standard 20-year coating and corrosion warranty. The warranty covers the whole system including the integrity of the steel itself. 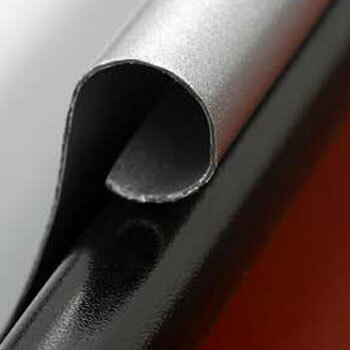 Nordic Steel Gutters are available in a choice of 6 colors (high-build polyester paint finishes). Coated finishes are UV stable and will not fade or crack. and naturally empty of leaves and debris.